The Hilton Buena Vista Palace in the Disney Springs Resort Area has several room types in two principal buildings–one the main tower, with multiple levels, and another a lower and somewhat distant accommodations building called the Island. 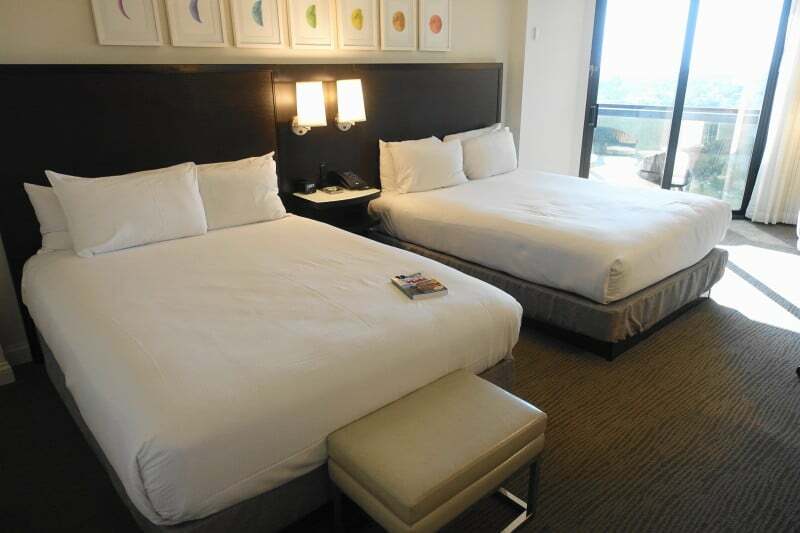 Rooms with a king bed and rooms with two queens are available, most with balconies. 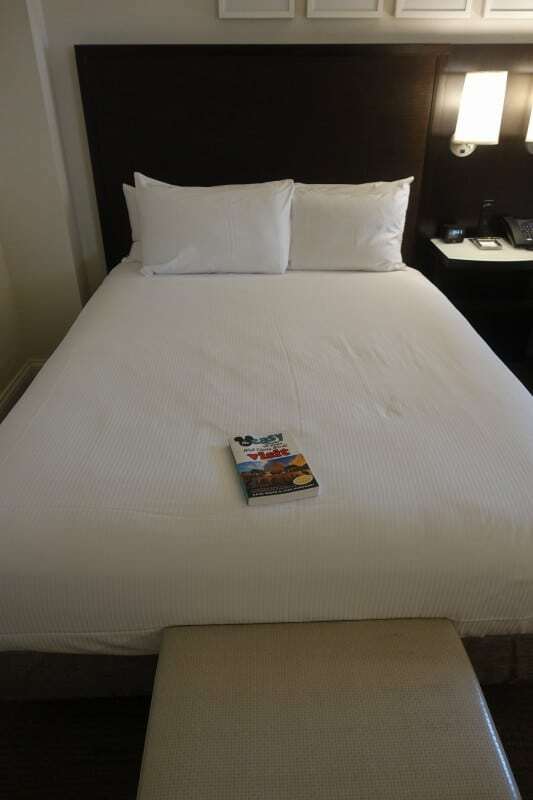 When booking, you can select your beds, and also choose your view. The Buena Vista Palace is a significant convention hotel, and as in all such hotels, multiple suite options are also available. 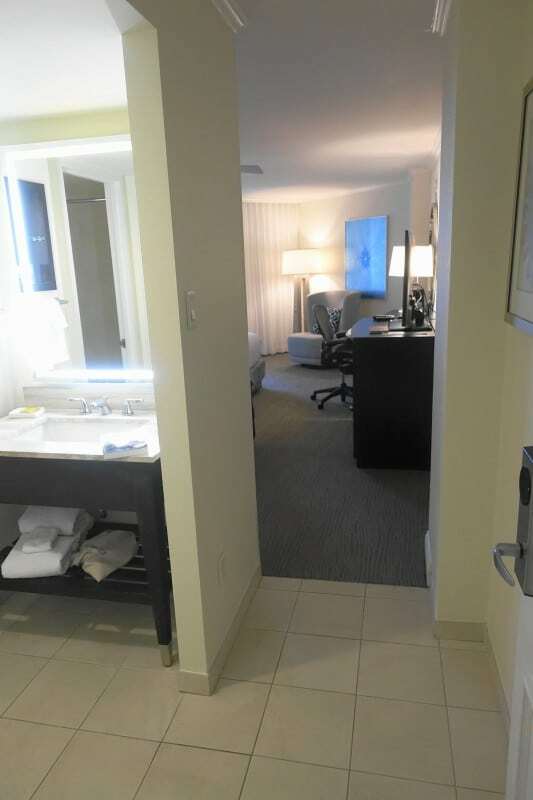 The entry has the divided bath and closet on the same side. 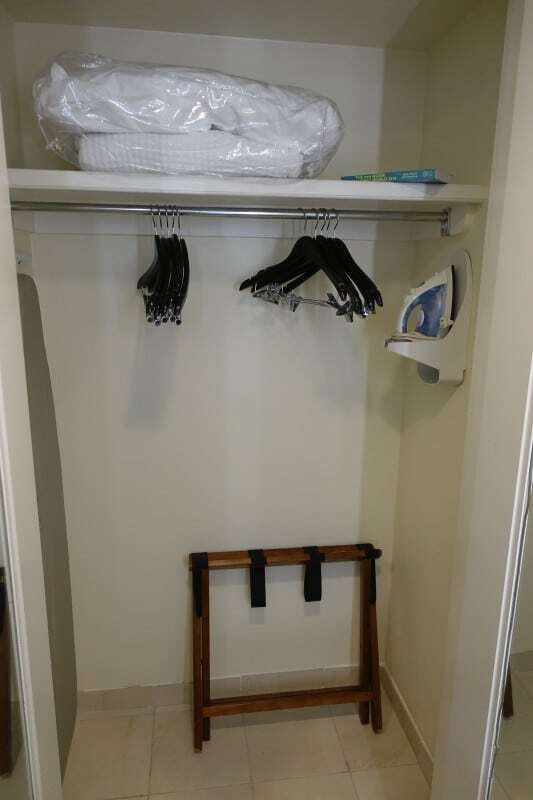 On the other side of the space is this good-sized closet, with a mirrored door (not shown, as I am shy). 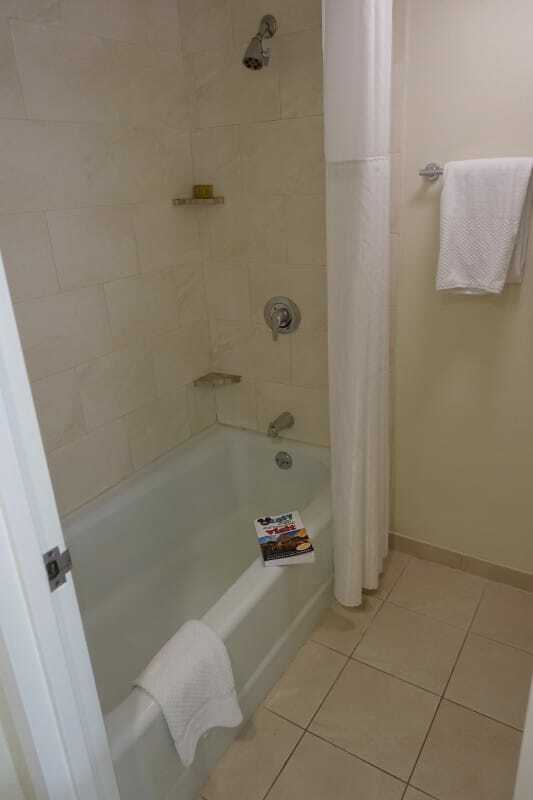 In a separate space you’ll find the toilet and tub-shower combo. 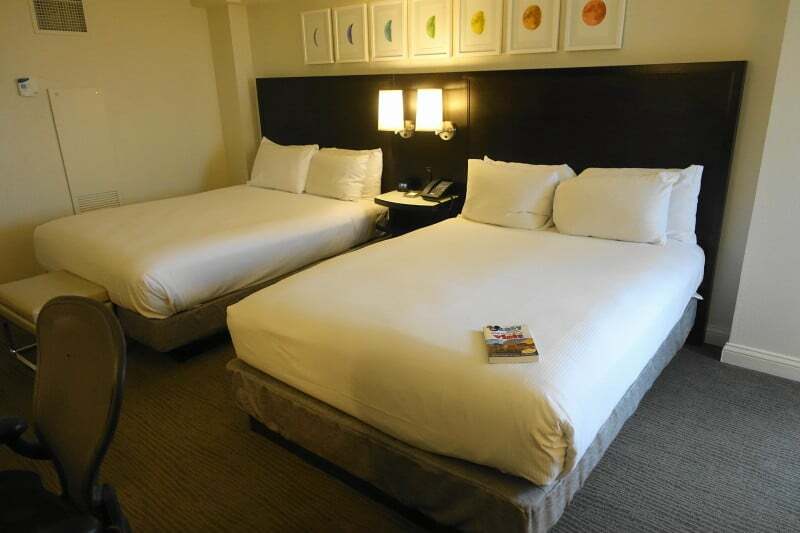 Deeper in the room, you’ll find the queen beds and a small bench on one side. 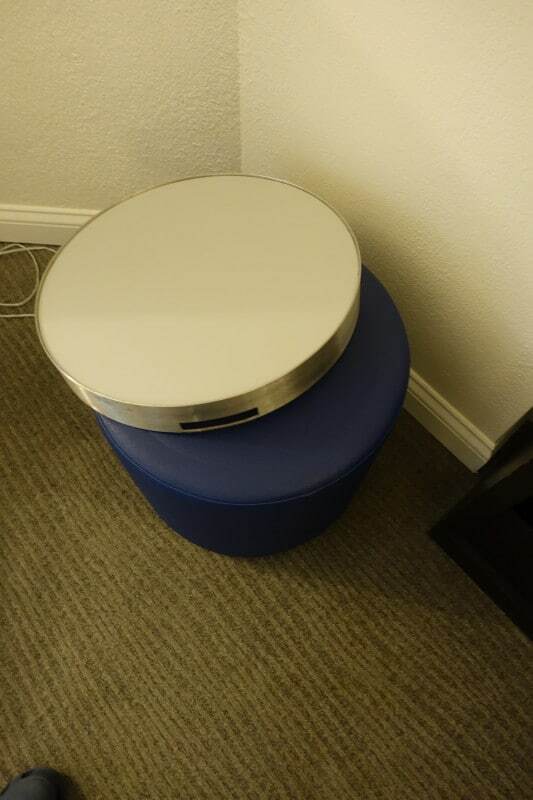 Between the beds you’ll find this bedside table with an open cubby below. 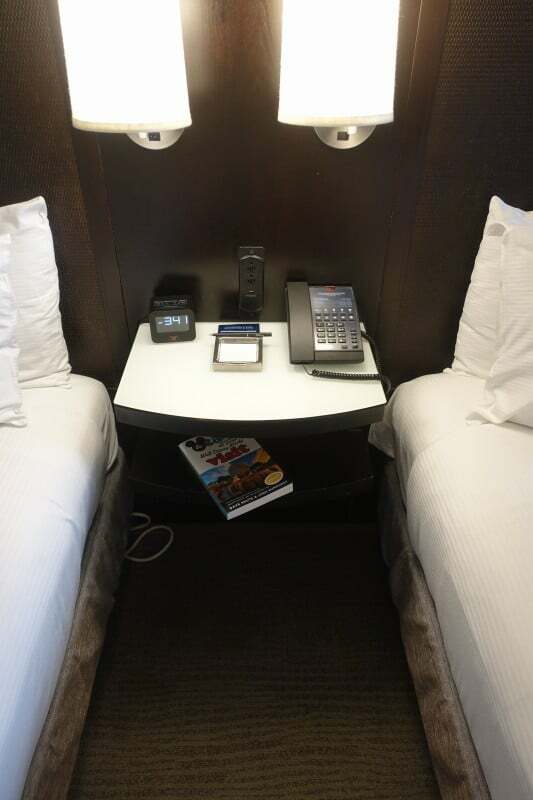 The other side of the room has a dresser with a mini-fridge inside and a TV above, a desk, and then back in the angled area, a large easy chair. 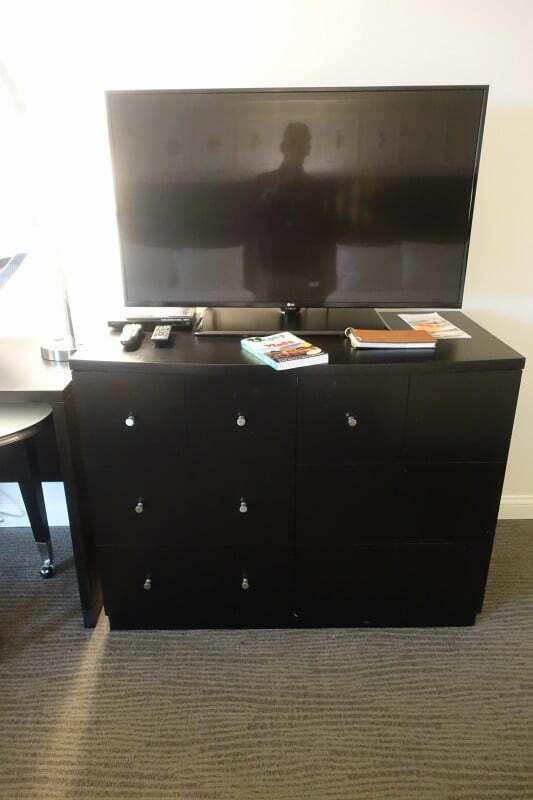 The dresser is topped by a large TV. 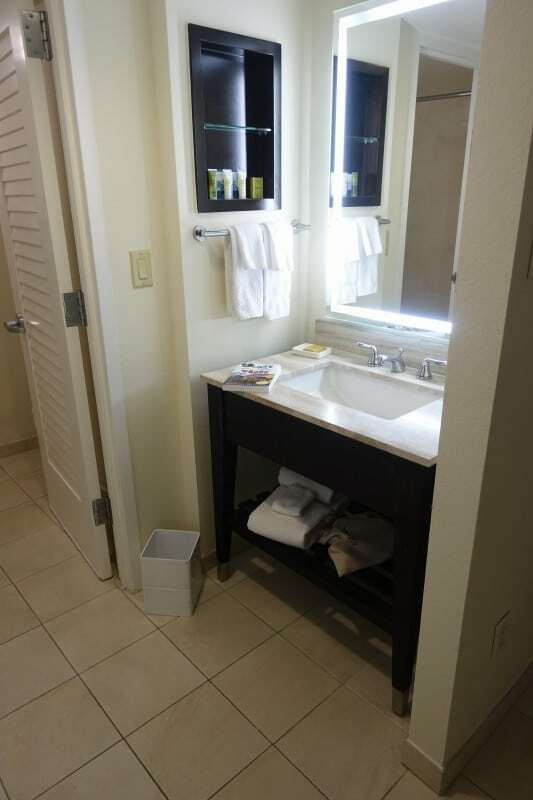 The three medium+ drawers are enough for the four people these rooms will sleep. 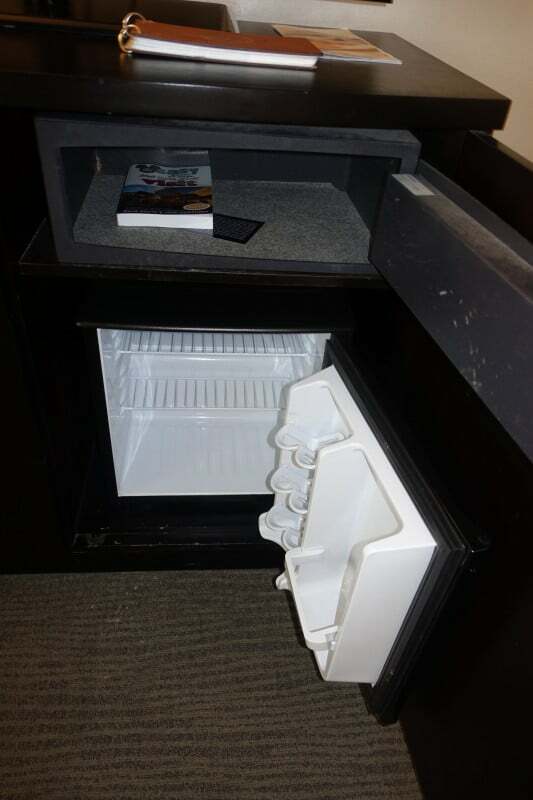 Next to these you’ll find the mini-fridge. 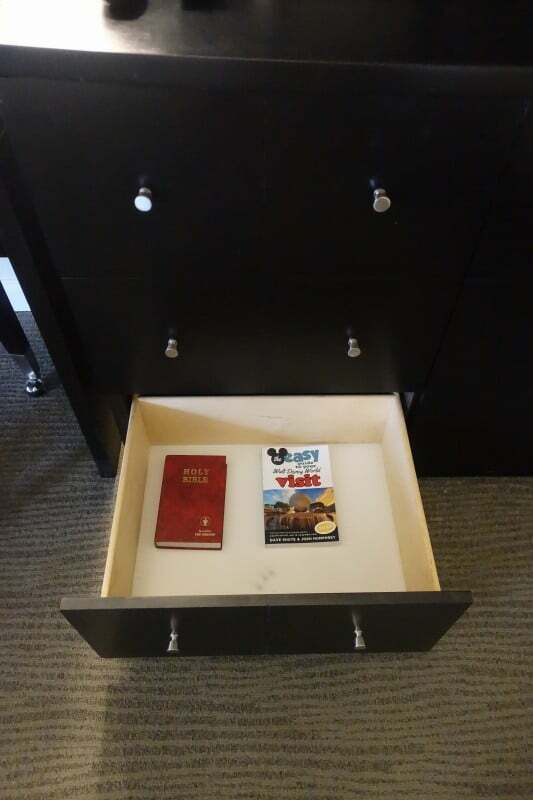 Note also the safe above it. Because I am a bad person, I forgot to measure it, but my book is 6 inches by 9 inches. 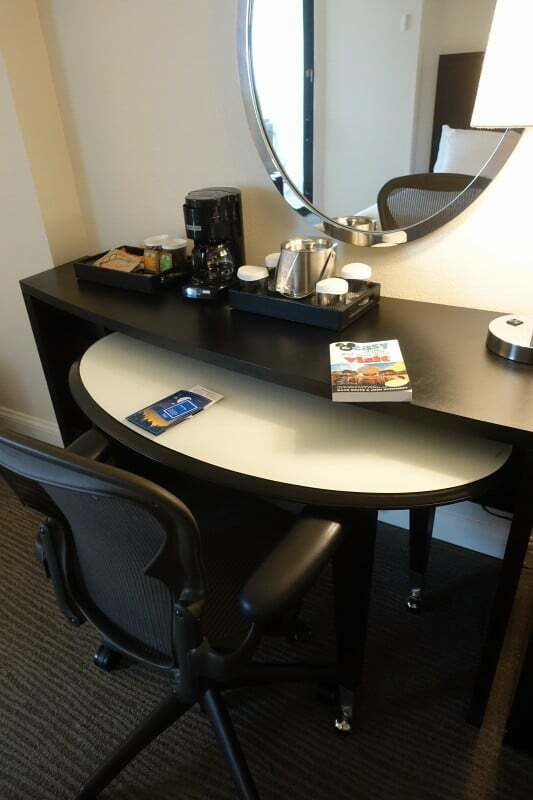 Further on this side you’ll find this multi-part desk thingy, with a coffee service on it. The lower part of the desk thingy is a rolling table that you can move elsewhere in the room and use for games, open heart surgery, and the like. 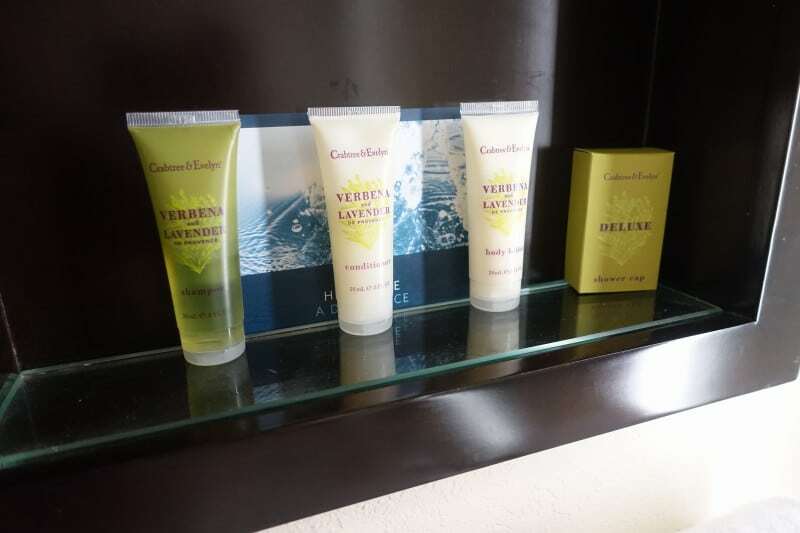 This is a nice touch that you will also find in some of the Disney deluxe resorts. 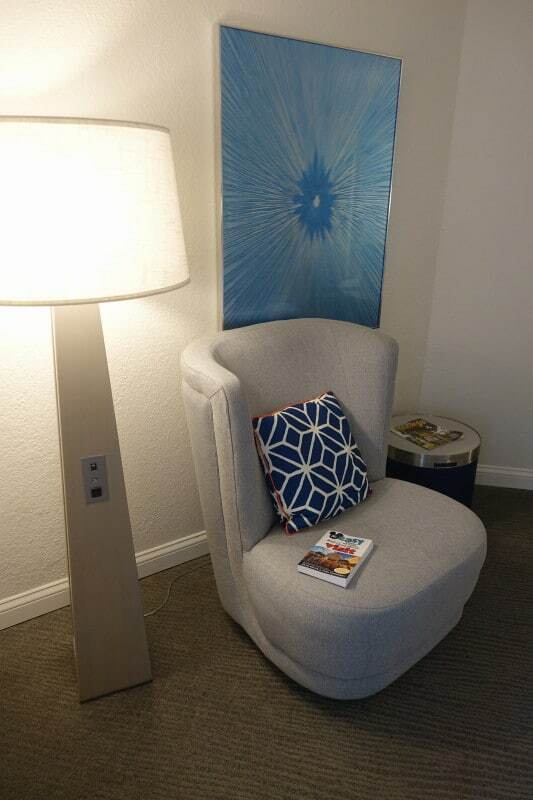 Beyond, in the angled area of the room, is this large easy chair with a lamp on one side and a table on the other. A closer view of the chair. The table top comes off, revealing an ottoman below. 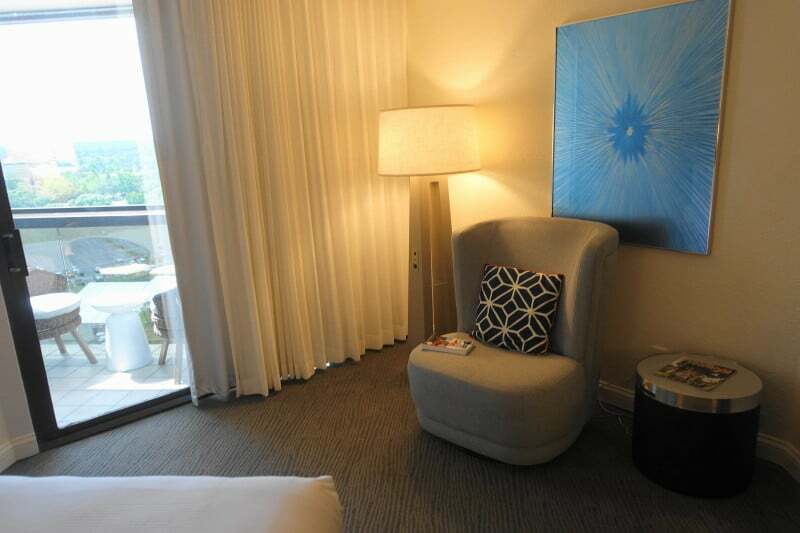 The ottoman, along with the bench at the foot of one of the beds, adds to the seating options of the room. At the end of most rooms is an angled balcony. 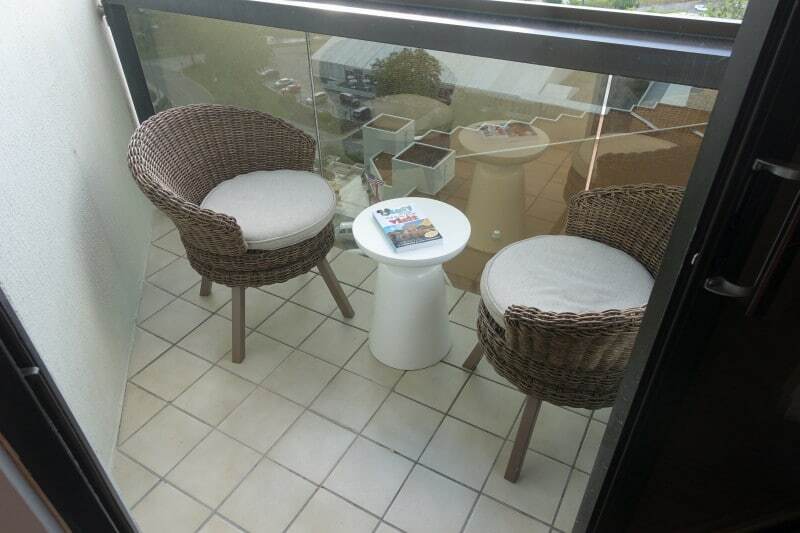 The angles of the room add interest to the space, but result in unusable corners in the balcony and a small overall usable balcony area. My room overlooked Saratoga Springs. 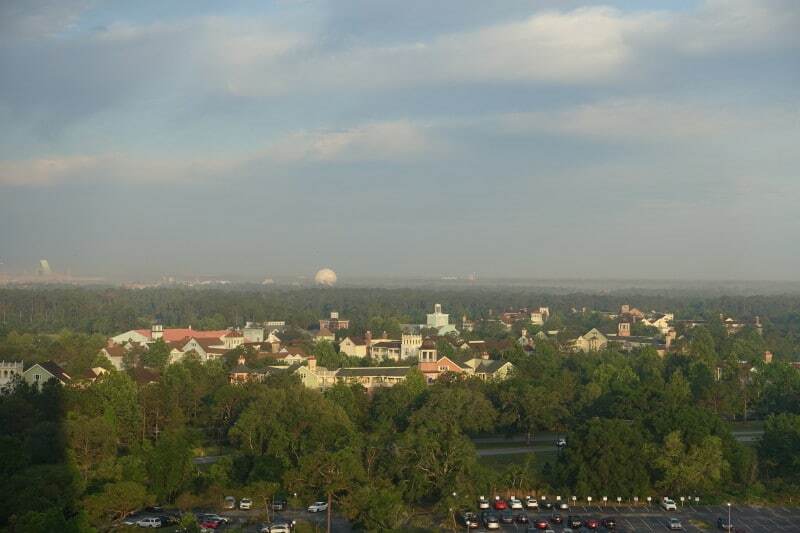 Some views are of sister Disney Springs Resort Area hotels, but you can also book pool, Disney Springs, and “Fireworks” views–the fireworks are quite distant, and the small balcony can lead to some crowding if you have four folks on it watching the fireworks. 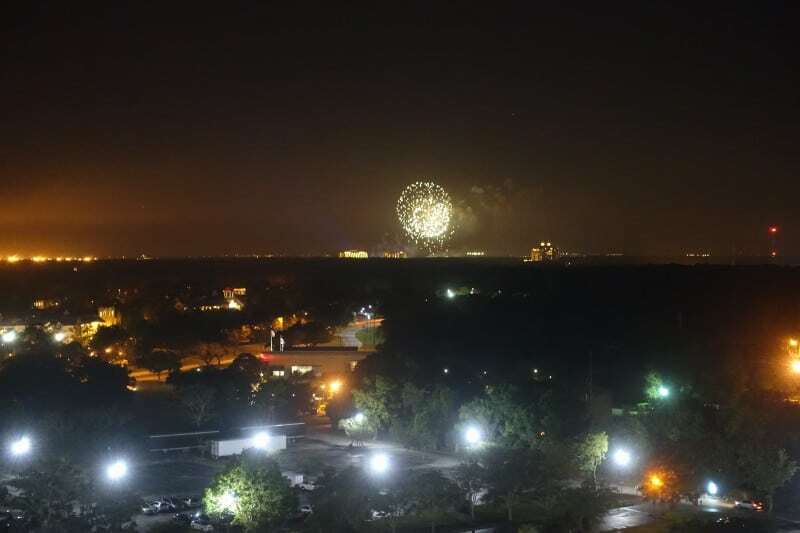 The Magic Kingdom fireworks from my balcony. 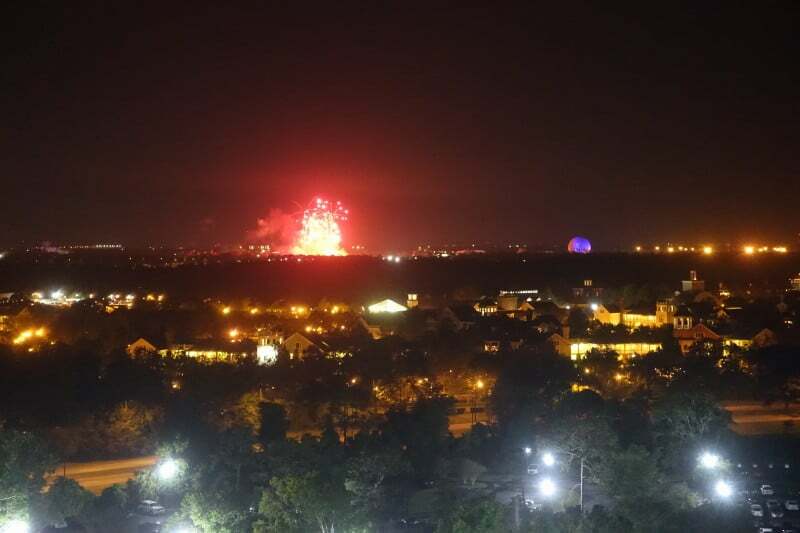 The Epcot fireworks from my balcony. 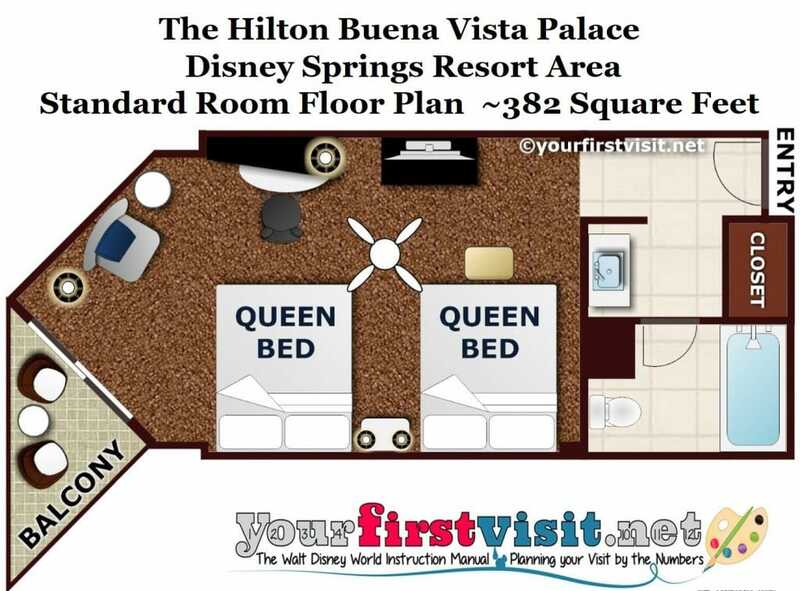 At around 382 square feet, the overall size of this Hilton Buena Vista Palace room is in the middle of the Disney deluxe resort range. But because it devotes less of its square footage to the bath/entry/closet area, at around ~274 square feet, the size of its living area is almost comparable to that in the largest Disney deluxes along the monorail. 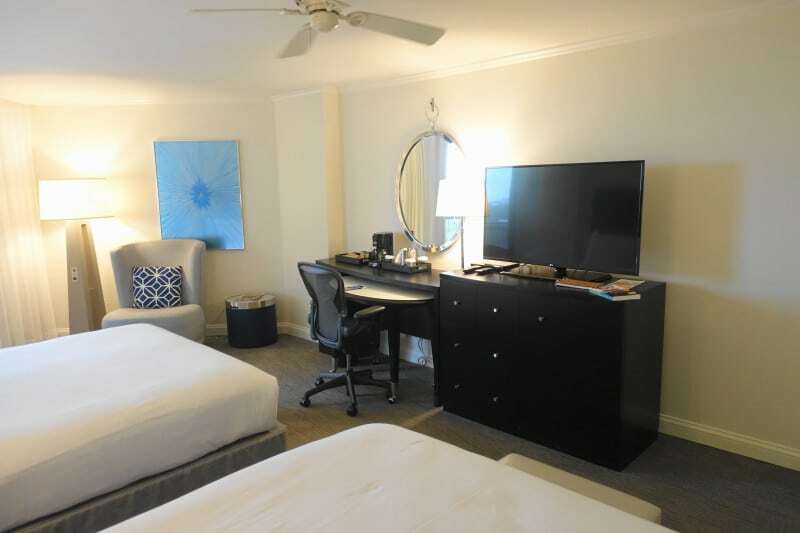 Overall this Hilton Buena Vista Palace room is bland but spacious, and is well-appointed for both families and couples. Hi, Dave! 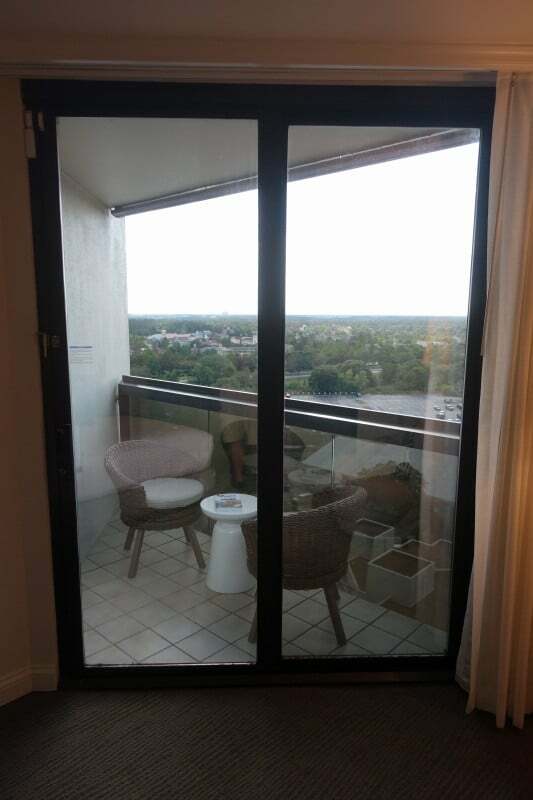 I’ve got a reservation (king bed, tower room, Disney Springs view) in a couple of weeks (my company refuses to let me stay on property because apparently they hate fun 😉 ). I can’t tell from Google Maps if it’s easy to walk to Disney Springs, or if I have to hike down to a pedestrian bridge or something. Can you enlighten me? THANK YOU!!! Hi Jennifer! You’ll have fun at the pool! It’s an easy walk. You walk to the street along a signed path, then turn left and walk down a sidewalk to a pedestrian bridge, and then from there you’re in DIsney Springs! All in, it’s less than half a mile.